The fourth edition of the (e)merge art fair will take place October 2 – 5, 2014, in Washington, DC, at the Capitol Skyline Hotel. The Washington Post also returns as the Presenting Sponsor of the fair. We have done the fair multiple times and last year we had a GREAT fair and plan to apply again in 2014. The (e)merge art fair connects emerging-art professionals from around the globe with collectors, curators and cultural decision makers in Washington, DC. The relaxed environment of (e)merge creates a focused, authentic art experience for a new generation of art consumers in the capital region. Metropolitan Washington DC is home to one of the nation’s wealthiest, youngest and most highly educated populations according to recent reports from Forbes, The Economist and The Washington Post. (e)merge delivers inside access to this rapidly expanding cultural market. In 2013, 80 exhibitors, including Present Company, Brooklyn, NY; NOMAD Gallery, Brussels; and Cynthia Corbett Gallery, London, [and Alida Anderson Art Projects, DMV] presented rising talent from all over the world at (e)merge. More than 5,500 art supporters engaged with painting, sculpture, digital media, performance and installation work by 150 artists from 30 countries in the fair’s Gallery and Artist Platforms. (e)merge’s exhibition program inspires a new echelon of art collectors and offers curatorial access to the latest movements in emerging art. The (e)merge Artist Platform presents a vetted selection of works by independent artists displayed throughout the hotel’s public areas. (e)merge is the only art fair that gives free exhibition space to artists without gallery representation. The 2014 (e)merge Vetting Committee members are: AI WEIWEI, artist, Beijing; MIKA YOSHITAKE, assistant curator, Hirshhorn Museum and Sculpture Garden, Washington, DC; and JEFFREEN M HAYES, director, Rebuild Foundation, Chicago, St. Louis & Omaha. The 2014 (e)merge Advisory Committee members are: Petra Leene, director, Amstel Gallery, Amsterdam; Amy Raehse, director, Goya Contemporary, Baltimore; José Ruiz, artist/curator, Present Company, Brooklyn; and Yvonne Force Villareal, co-founder, Art Production Fund, New York. The Phillips Collection, Washington, DC, will present the second annual The Phillips Collection Emerging Artist Prize at the 2014 edition of (e)merge. Museum Director Dorothy Kosinski and Curators Klaus Ottmann and Vesela Sretenović will select the winner from works on display at the (e)merge art fair. The Phillips Collection Emerging Artist Prize is made possible by the generous support of Hank and Carol Brown Goldberg. ONLINE APPLICATIONS ARE NOW BEING ACCEPTED from GALLERIES and ARTISTS. deadline: May 30, 2014. Loads of information on the EXHIBITOR SERVICES page. Who owns the copyright for this photo? Unless you’ve been living under a rock these past few days, you have probably seen the Ellen DeGeneres orchestrated selfie. 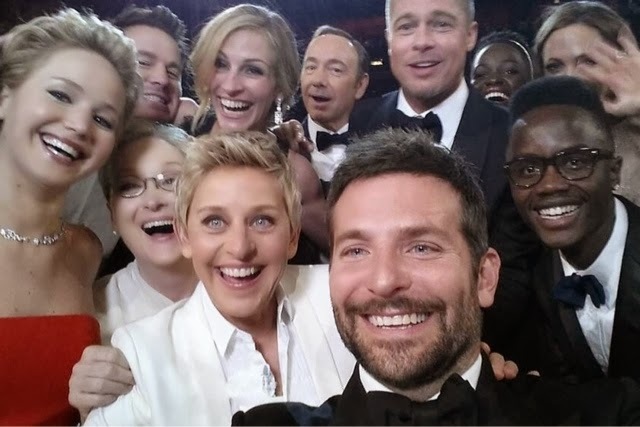 For a recap, Ellen wanted to beat the all-time record for re-tweets by gathering a gaggle of actors and actresses for a group selfie. She used a Samsung phone for the photo, which was a prop provided by Samsung, one of the sponsors at the Oscars. The camera required some distance to encompass the whole group, so Ellen handed the camera off to Bradley Cooper, who by virtue of being at the front and having with longer arms than Ellen, took the iconic photo. But who actually owns the copyright for the photo? There are actually four potential players: Bradley Cooper, The Academy of Motion Picture Arts and Sciences, Samsung, and Ellen DeGeneres. The Associated Press thinks it is Ellen DeGeneres. They asked her for permission to use the photo, which she granted. However, traditionally, copyright ownership goes to the photo’s creator, which is usually the person that takes the photo. In this case, that is Bradley Cooper.